A smaller entry of cattle at Markethill on Saturday, December 1st continued to sell in an exceptionally strong demand with prices for both store cattle and weanlings seeing no reduction. Heavy heifers sold to a top of £226 per 100 kilos for 550k Charolais at £1,245 for a Cullyhanna farmer followed by £221 per 100 kilos for 518k Charolais at £1,145 from a Cullyhanna producer. Top price heifer £1,325 for 660k from a Crossmaglen farmer £200 per 100 kilos. Several heavy heifers sold from £1,200 to £1,300 each. Good quality middleweight heifers sold from £185 to £221 per 100 kilos for 482k at £1,065 for a Derrynoose farmer. Cullyhanna farmer 552k, £1,245, £226.00; Cullyhanna farmer 518k, £1,145, £221.00; Armagh farmer 568k, £1,255, £221.00; Armagh farmer 518k, £1,115, £215.00; Armagh farmer 550k, £1,175, £214.00; Cullyhanna farmer 542k, £1,155, £213.00; Cullyhanna farmer 626k, £1,295, £207.00; Fivemiletown farmer 630k, £1,305, £207.00; Fivemiletown farmer 606k, £1,245, £205.00 and Crossmaglen farmer 662k, £1,325, £200.00. Derrynoose farmer 482k, £1,065, £221.00; Derrynoose farmer 406k, £845, £208.00; Loughgilly farmer 460k, £925, £201.00; Cullyhanna farmer 472k, £935, £198.00; Keady farmer 442k, £855, £193.00; Derrynoose farmer 384k, £735, £191.00; Lurgan farmer 400k, £755, £189.00 and Loughgilly farmer 438k, £825, £188.00. 100 store bullocks maintained an excellent demand with good quality forward bullocks selling from £188 to £208 per 100 kilos for 518k at £1.075. Aberdeen Angus bullocks to £200 per 100 kilos for 520k at £1,045 from a Tynan producer. Top price bullock £1325 for 660k Limousin £200 per 100 kilos for a Dromore farmer. Good quality middleweights sold from £188 to £232 for 408k Charolais at £945. Glenanne farmer 518k, £1,075, £208.00; Tynan farmer 522k, £1,045, £200.00; Dromore farmer 662k, £1,325, £200.00; Glenanne farmer 540k, £1,075, £199.00; Dromore farmer 588k, £1,155, £196.00; Dromore farmer 550k, £1,075, £196.00; Glenanne farmer 508k, £985, £194.00 and Glenanne farmer 560k, £1,065, £190.00. 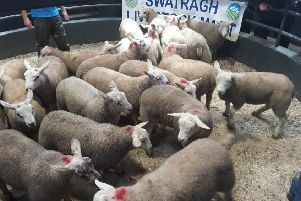 Aughnacloy farmer 408k, £945, £232.00; Glenanne farmer 462k, £995, £215.00; Annaghmore farmer 402k, £855, £213.00; Benburb farmer 492k, £995, £202.00; Belleek farmer 458k, £925, £202.00; Belleeks farmer 470k, £935, £199.00 and Keady farmer 482k, £905, £188.00. 120 weanlings sold in another very strong trade. Good quality male weanlings sold to a top of £267 per 100 kilos for 240k Limousin at £640 from a Markethill farmer followed by £261 per 100 kilos for 284k Limousin at £740 from a Markethill producer. All good quality males sold from £215 to £250 per 100 kilos. Good quality heifer weanlings sold from £200 to £276 per 100 kilos for 214k Limousin at £590 from a Markethill producer. Markethill farmer 240k, £640, £267.00; Markethill farmer 284k, £740, £261.00; Newtownhamilton farmer 288k, £720, £250.00; Gilford farmer 266k, £655, £246.00; Newry farmer 238k, £580, £244.00; Gilford farmer 252k, £605, £240.00; Markethill farmer 268k, £640, £239.00; Newry farmer 234k, £545, £233.00 and Markethill farmer 226k, £525, £232.00. Markethill farmer 214k, £590, £276.00; Markethill farmer 226k, £610, £270.00; Armagh farmer 250k, £600, £240.00; Markethill farmer 256k, £585, £229.00; Gilford farmer 292k, £660, £226.00; Armagh farmer 282k, £635, £225.00; Armagh farmer 276k, £620, £225.00 and Gilford farmer 236k, £520, £220.00.